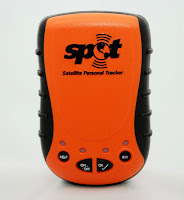 First off, we've never used the new Spot GPS satellite messenger and personal tracker (site), but we sure like the idea of it. Alone on long, backcountry runs it's hard to know what might be coming your way - good, bad, or hungry. With the Spot, a push of a button can tell family and friends that everything's OK or that Life Flight better get the rotors warmed up. And with exact coordinates available via computer, they should be able to find you in no time. The cost of the device isn't bad ($169.99). Same with the one year service subscription ($99.99). Living to run another day: priceless. When we get our hands on one, we'll give the full, stress-tested low down. Stay tuned.